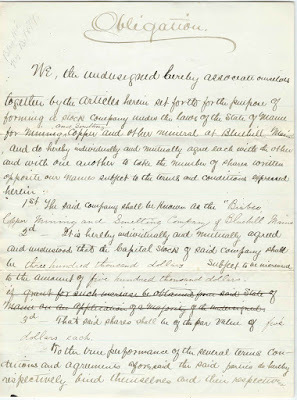 1879 obligation document regarding the creation of the Bisbee Copper Mining and Smelting Company of Blue Hill, Maine; signed by nine prominent businessmen of Camden, Maine; Belfast, Maine and Bangor, Maine. D. H. Bisbee of Camden, Maine, who owned 7500 shares. Presumably Deplura H. Bisbee, born July 11, 1818 at Buckfield, Maine, son of Captain Hopestill Bisbee and Martha (Sturtevant) Bisbee. Deplura H. Bisbee married 1) Elizabeth Heald, who died shortly after their marriage; and 2) Lydia Heald, with whom he had 4 children, two of whom died young. Seth L. Milliken of Belfast, Maine, who owned 7500 shares. A U.S. representative from Maine, Seth Llewellyn Milliken was born December 12, 1831 at Montville, Maine, son of William Llewellyn and Lucy P. (Perrigo) Milliken. Seth married Elizabeth S. Arnold and had at least two children, Mary M. Milliken and Seth Mellen Milliken. Isaac Coombs of Camden, Maine, who owned 7500 shares. 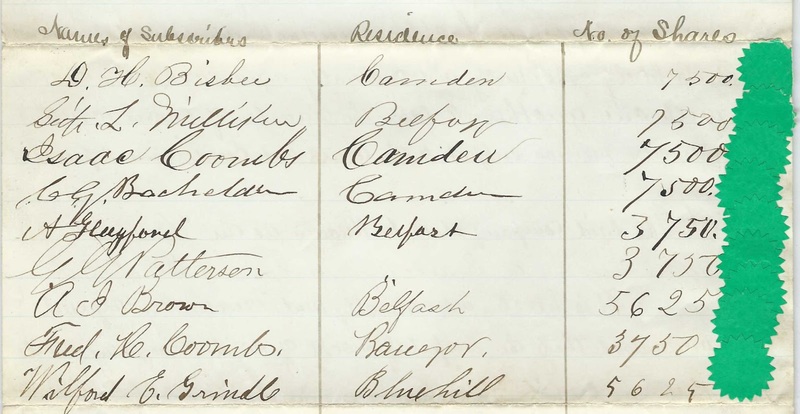 Presumably Captain Isaac Coombs, April 26, 1827 at Isleboro, Maine, son of Isaac and Elizabeth (Boardman) Coombs. Isaac married 1) Almira Drinkwater; 2) Arathusa Drinkwater, with whom he had three children; and 3) Hattie T. Handley. C. G. Bachelder of Camden, Maine, who owned 7500 shares. Presumably Cyrus Gale Bachelder, born January 23, 1805 at Union, Maine, son of Nathaniel and Ruth (Morrill) Bachelder. Cyrus married Adeline Simmons, with whom he had at least six children. A. Hayford of Belfast, Maine, who owned 3750 shares. Presumably Axel Hayford, who was born April 20, 1814 at Hartford, Maine, son of Captain Gad and Sally Howland (Bisbee) Hayford. He married Elizabeth Lincoln Bicknell; and 2) Mary Cottrell; he had children with each wife. G. G. Patterson of Belfast, Maine, who owned 3750 shares. George G. Patterson, born about 1850, son, I believe of Robert and Susan Patterson. George married Isaphene M. Pitcher at Belfast, Maine, on August 25, 1869. At that time he gave his occupation as merchant. He had at least one child, George Robert Patterson, born November 29, 1870. A. I. 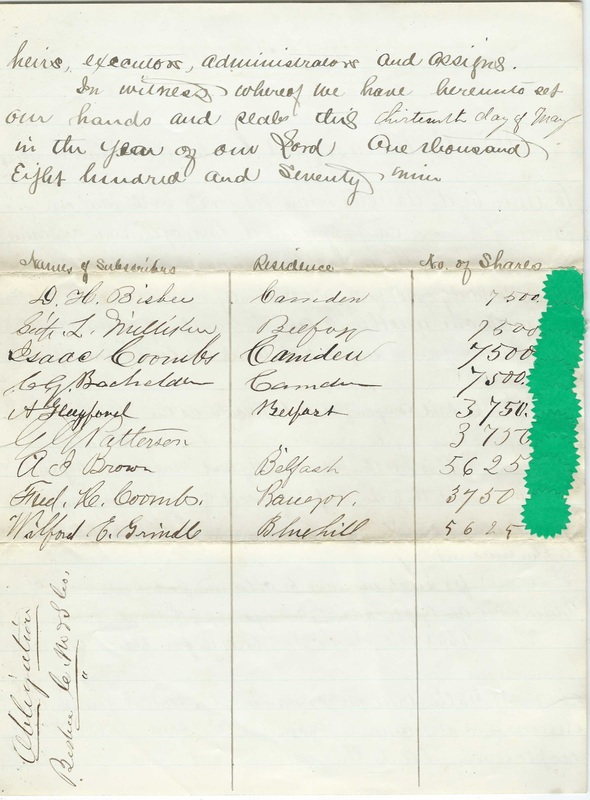 Brown of Belfast, Maine, who owned 5625 shares. Presumably Arthur Irving Brown, born January 11, 1845 at Belfast, Maine, son of Edmund Phinney Brown and Joanna D. (Pierce) Brown. Arthur married Harriet L. Patterson and had at least one child, son Arthur Frederick Brown, born about 1877. Fred H. Coombs [not sure of middle initial] of Bangor, Maine, who owned 3750 shares. Possibly Frederick Hobbs Coombs, born May 1, 1832, son of Philip Henry Coombs and Eliza Webster (Boardman) Coombs. He was the City Engineer at Bangor. Wilford E. Grindle of Blue Hill, Maine, who owned 5625 shares. Wilford E. Grindle was born April 26, 1838 at Sedgwick, Maine, son of Joshua Grindle and Prudence Lear (Eaton) Grindle. Wilfred married 1) Betsey Gray, with whom he had several children; and 2) Laurie A. Fleming. 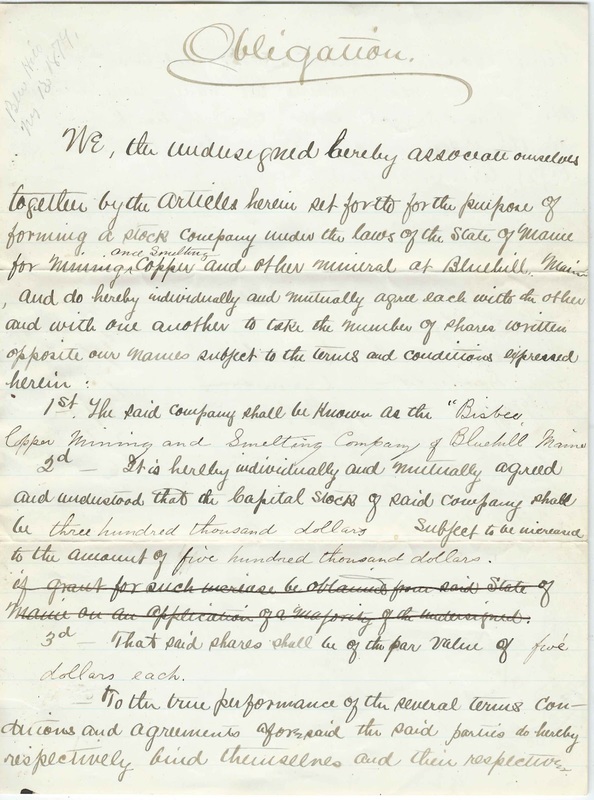 Interestingly, while I was researching online, I found an 1879 quit claim deed regarding the Bisbee Copper Mining and Smelting Company; it contains several of the names shown above.